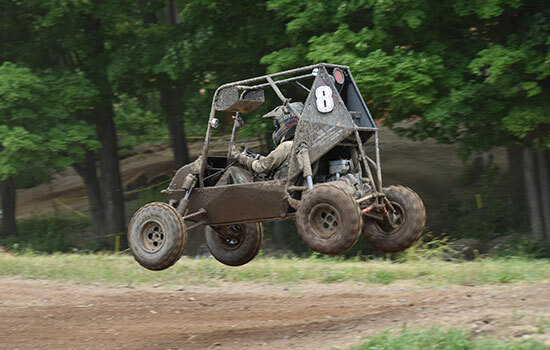 Doug Botto, team manager and driver of RIT Racing gets some air during a lap of the endurance race at the recent 2016 Baja SAE Rochester competition. The team went on to take fourth place in the event and second place overall among 100 teams competing from colleges in the U.S., Canada, Brazil, Venezuela and India. RIT’s Baja race season could have ended with only 20 minutes left in the four-hour endurance race. Spectators watched uneasily as the No. 8 car was towed off the field with some front-end damage. But, RIT Baja would return to the race in under 10 minutes after repairs, catch up to the leaders and close the 2016 Baja SAE Rochester event with an exciting fourth-place finish. The competition took place June 9-12 with several events at RIT’s Gordon Field House and Activities Center and at Hogback Hill Motocross Racetrack in Palmyra, N.Y. RIT was second overall in the four-day competition among 100 collegiate race teams. The University of Michigan-Ann Arbor came in first overall, and topped the field with several individual awards including the coveted Mike Schmidt Iron Team Award for the best overall scores for the season. More than 1,200 students from universities such as Purdue, Clemson, the University of Rochester and Clarkson University competed. The University of Prince Edward Island (Canada) and City College of New York fielded teams for the first time at Baja SAE Rochester. They were joined by a large contingent of university teams from Canada, Venezuela, India, Brazil and Mexico. In SAE Baja competitions, engineering students design and build off-road vehicles that must survive the severe punishment of rough terrain—hill and rock climbs—acceleration and maneuverability challenges. Teams run the four-hour endurance race over hills, rocks, log barriers and around hair-pin turns. For Sunday’s endurance final, there were still patches of mud from the rain on Saturday. High winds kicked up dust limiting visibility in some places. After more than 40 laps, RIT Baja led. They had one of the fastest course lap times at four minutes and 15 seconds, and it held up throughout the race. But with only a short time until the checkered flag, and with a broken upper control-arm failure on the front suspension, it looked like RIT might have had to call it a day. “We fixed the control arm in nine minutes,” said Nate Wynne, fourth-year mechanical engineering technology student and the team’s lead suspension tech. RIT driver Doug Botto roared back onto the course. In the endurance race, the top finishers were the University of Michigan-Ann Arbor, Cornell University, the University of Akron and RIT. The event is more than racing, said Cuneyt Oge, SAE International president, who addressed the student teams, and said their participation on Baja teams as well as classwork that includes information about sensor technologies and 3D-printing, for example, will contribute to how the automotive industry evolves over the coming years. The Mike Schmidt Iron Team Award was presented to the University of Michigan Ann Arbor. RIT and Cornell were second and third, respectively. Mike Schmidt was an early member of the RIT Baja team. For several years, the team did not compete and it was through his influence and several other RIT Baja alumni to resurrect the team, competing in the three national events through SAE. Schmidt, however, died in a car accident just short of his graduation from RIT. Marty Gordon, team adviser and Rochester event coordinator, recommended the award to recognize Schmidt’s inspiration. Schmidt’s father, Michael, presented the award.